1 Gigabyte Free with each top-up! 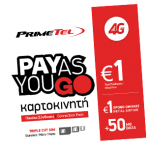 Get the new PayAsYouGo package for €1! Get PrimeTel Pay as you go and get 1 Gigabyte FREE with each top–up! Get 1 Gigabyte FREE with each top–up! The offer applies to new prepaid subscribers by transferring their number to PrimeTel Prepaid, as well as to Special Promotional Connection Packs. The Subscriber will benefit the offer of 1 Gigabyte DATA for at least 1 year. 1 Gigabyte DATA only applies to internet use in Cyprus. Previous DATA available is deleted and the DATA of the new top – up is valid. The 1 Gigabyte DATA offer cannot be combined with the Bonus plan, or Student promo. Other terms and conditions of the PRIMETEL PayAsYouGo plan apply.